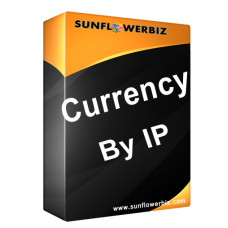 This extension will detect customer's IP and will display currency based on customer's IP address. It's compatible with our another module from us: http://www.sunflowerbiz.com/opencart-different-product-price-for-each-currency-2-0 which can set different prodcut price for each currency. With the 2 modules, you can set different product price by ip address. Please note: the module requires vqmod! PLEASE INSTALL VQMOD (http://vQmod.com) BEFORE INSTALL THIS MODULE! -Download Vqmod from http://vqmod.com and install first.